and let us wear the weapons of light "(Rom 13.12). Enveloped by the joy and the hope that radiate from the face of the divine Child, we meet again this year for the exchange of Christmas greetings, bringing in our hearts all the labors and joys of the world and of the Church. I sincerely wish a Holy Christmas to you, to your collaborators, to all the people who serve in the Curia, to the Pontifical Representatives and to the collaborators of the Nunciatures. And I wish to thank you for your daily dedication to the service of the Holy See, of the Church and of the Successor of Peter. Thank you very much! Allow me also to warmly welcome the new Substitute of the Secretariat of State, His Excellency Mons. Edgar Peña Parra, who began his delicate and important service on October 15th. His Venezuelan provenance reflects the catholicity of the Church and the need to open more and more horizons to the ends of the earth. Welcome, dear Excellency, and good work! Christmas is the feast that fills us with joy and gives us the certainty that no sin will ever be greater than the mercy of God, and no human act can ever prevent the dawn of the divine light from being born and reborn in the hearts of men. It is the feast that invites us to renew the evangelical commitment to proclaim Christ, the Savior of the world and the light of the universe. For if "Christ," holy, innocent, immaculate "(Heb 7:26), did not know sin (cf. 2 Cor 5:21) and came only for the purpose of atone for the sins of the people (cf. Heb 2:17), the Church, which includes sinners within her and is therefore holy and immaculate and at the same time always in need of purification, continually advances on the path of penance and renewal. The Church "continues its pilgrimage among the persecutions of the world and the consolations of God" - between the persecutions of the worldly spirit and the consolations of the Spirit of God - proclaiming the passion and death of the Lord until He comes (cf. 1 Cor 11,26). From the virtue of the risen Lord he draws the strength to overcome with patience and love the afflictions and difficulties that come both from within and from outside, and to unveil in the midst of the world, with fidelity, though not perfectly, the mystery of him, until at the end of time it will be manifested in the fullness of light "(Second Vatican Ecumenical Council, Dogmatic Constitution Lumen Gentium, 8). On the basis, therefore, of the firm conviction that light is always stronger than darkness, I would like to reflect with you on the light that connects Christmas - that is, the first coming in humility - to the Parousia - the second coming in splendor - and confirms in hope that never disappoints. That hope on which depends the life of each one of us and the whole history of the Church and of the world. A Church without hope would be ugly! Jesus, in reality, is born in a socio-political and religious situation full of tension, agitations and obscurity. His birth, on one side awaited and on the other rejected, summarizes the divine logic that does not stop before evil, rather it transforms it radically and gradually into good, and also the malignant logic that transforms even good into evil, to bring humanity to remain in despair and darkness: "the light shines in the darkness, but the darkness has not received it" (Jn 1: 5). Every year Christmas reminds us, however, that the salvation of God, freely given to all humanity, to the Church and in particular to us, consecrated persons, does not act without our will, without our cooperation, without our freedom, without our daily effort. Salvation is a gift, this is true, but a gift that must be welcomed, guarded and made to bear fruit (cf. Mt 25: 14-30). Being Christians, in general, and for us in particular being anointed, consecrated of the Lord does not mean behaving like a circle of privileged people who believe they have God in their pockets, but from people who know they are loved by the Lord in spite of our to be sinners and unworthy. In fact, the consecrated are nothing but servants in the Lord's vineyard, who must give, in due course, the harvest and the proceeds to the Master of the vineyard (cf. Mt 20: 1-16). The Bible and the history of the Church show us that many times even the elect themselves, on the way, start thinking, believing and behaving as masters of salvation and not as beneficiaries, as controllers of the mysteries of God and not as humble distributors as customs officers of God and not as servants of the flock entrusted to them. So many times - by excessive zeal and misdirected - instead of following God we stand before Him, like Peter who criticized the Master and deserved the harshest reproach that Christ ever addressed to a person: "Go after me, Satan ! Because you do not think according to God, but according to men "(Mk 8:33). In the turbulent world, the boat of the Church has lived and lives difficult times this year, and has been hit by storms and hurricanes. Many have found themselves asking the Master, who apparently slept: «Master, do not you care that we are lost?» (Mk 4,38). Others, stunned by the news, have begun to lose confidence in it and to abandon it; others, for fear, for interest, for ulterior motives, have tried to beat his body increasing the wounds; others do not hide their satisfaction in seeing her shaken; many, however, continue to cling to the certainty that "the gates of hell shall not prevail against it" (Mt 16:18). Meanwhile, the Bride of Christ continues her pilgrimage between joys and afflictions, between successes and difficulties, external and internal. Certainly the internal difficulties remain always the most painful and most destructive ones. There are many afflictions. How many immigrants - forced to leave their homeland and risk their lives - meet death, or those who survive but find the doors closed and their brothers in humanity committed to political and power conquests. How much fear and prejudice! How many people and how many children die every day due to lack of water, food and medicine! How much poverty and misery! How much violence against the weak and against women! How many scenarios of declared and undeclared wars! How much innocent blood is shed every day! How much inhumanity and brutality surround us on every side! How many people are systematically tortured even today in police stations, prisons and refugee camps in different parts of the world! We also live, in reality, a new age of martyrs. It seems that the cruel and atrocious persecution of the Roman empire has no end. New Neros are continually born to oppress believers, only for their faith in Christ. New extremist groups are multiplying, targeting churches, places of worship, ministers and simple faithful. New and old circles and conventicles live feeding on hatred and hostility towards Christ, the Church and believers. How many Christians still live today under the weight of persecution, marginalization, discrimination and injustice in many parts of the world! They continue, however, courageously to embrace death in order not to deny Christ. How difficult it is today to live faith freely in many parts of the world where religious freedom and freedom of conscience are lacking! On the other hand, the heroic example of the martyrs and the numerous good Samaritans, that is, of the young, of the families, of the charitable and voluntary movements and of many faithful and consecrated persons, does not however forget the counter-testimony and the scandals of some sons and ministers of the Church. I limit myself here only to the two wounds of abuse and infidelity. For several years the Church has been seriously committed to eradicating the evil of abuse, crying revenge to the Lord, to the God who never forgets the suffering experienced by many minors because of clerics and consecrated persons: abuses of power, conscience and sexuality. Thinking of this painful subject, the figure of King David came to my mind - an "anointed one of the Lord" (cf. 1 Sam 16,13; 2 Sam 11-12). He, from whose lineage the Divine Child derives - also called the "Son of David" - despite his being elected, king and anointed by the Lord, he committed a threefold sin, ie three serious abuses together: sexual abuse, power and consciousness. Three distinct abuses, which however converge and overlap. The story begins, as we know, when the king, despite being an expert in war, remains at home to idle instead of going among the people of God in battle. David takes advantage, for his convenience and interest, of his being the king (abuse of power). The anointed, abandoning himself to comfort, begins the irrepressible moral decline and conscience. And it is in this context that he, from the terrace of the palace, sees Bathsheba, wife of Uriah the Hittite, while she bathes and feels drawn to her (cf. 2 Sam 11). He sends her to call and joins her (another abuse of power, more sexual abuse). So abuses a married woman and alone and, to cover her sin, calls home Uria and tries in vain to convince him to spend the night with his wife. And then he orders the head of the army to expose Uria to certain death in battle (another abuse of power, more abuse of conscience). The chain of sin spreads like wildfire and quickly becomes a network of corruption. He stayed home to idle. From the sparks of sloth and lust, and from the "lowering of the guard," begins the diabolical chain of serious sins: adultery, lies and murder. Assuming, being king, of being able to do everything and obtain everything, David also tries to deceive the husband of Bathsheba, the people, himself and even God. The king neglects his relationship with God, transgresses the divine commandments, hurts his integrity moral, without even feeling guilty. The anointed continued to exercise his mission as if nothing had happened. The only thing that mattered to him was to safeguard his image and his appearance. "Because those who do not realize they are committing serious defects against God's Law can let themselves go to a kind of daze or torpor. Since they do not find anything serious to reproach themselves, they do not feel that lukewarmness that little by little they are taking possession of their spiritual life and end up wearing and corrupting themselves "(Apostolic Exhortation Gaudete et exsultate, 164). From sinners they end up becoming corrupt. Even today there are many "God's anointed ones", consecrated men, who abuse the weak, taking advantage of their moral power and persuasion. They perform abominations and continue to exercise their ministry as if nothing had happened; they do not fear God or his judgment, but they fear only to be discovered and unmasked. Ministers who lacerate the body of the Church, causing scandal and discrediting the saving mission of the Church and the sacrifices of many of their confreres. Even today, dear brothers and sisters, many David, without batting an eyelid, enter the network of corruption, betray God, his commandments, his vocation, the Church, the people of God and the trust of the little ones and their families. Often behind their immense kindness, impeccable industriousness and angelic face, they shamelessly hide an atrocious wolf ready to devour innocent souls. The sins and crimes of consecrated persons are colored in colors even darker than infidelity, shame and deform the face of the Church undermining its credibility. In fact, the Church, together with her faithful sons, is also the victim of these infidelities and of these real "peculation crimes". it is clear that in the face of these abominations the Church will not be spared in doing everything necessary to bring to justice anyone who has committed such crimes. The Church will never try to cover up or underestimate any case. It is undeniable that some responsible, in the past, for lightness, for disbelief, for lack of preparation, for inexperience - we must judge the past with hermeneutics of the past - or for spiritual and human superficiality have treated many cases without due seriousness and readiness. This must never happen again. This is the choice and decision of the whole Church. In February, the Church will reiterate its firm will to continue, with all its strength, on the path of purification. The Church will question itself, also using experts, on how to protect children; how to avoid such misadventures, how to treat and reintegrate victims; how to strengthen training in seminars. We will try to turn the mistakes committed into opportunities to eradicate this scourge not only from the body of the Church but also from that of society. In fact, if this serious calamity has hit some consecrated ministers, one wonders: how much could it be deep in our societies and in our families? Therefore, the Church will not limit herself to taking care of herself, but will try to face this evil that causes the slow death of so many people, on the moral, psychological and human level. speaking of this scourge, some inside the Church are fervent against certain operators of communication, accusing them of ignoring the overwhelming majority of cases of abuse, which are not committed by clerics of the Church - statistics speak for more than 95% - and accusing them to intentionally want to give a false image, as if this evil had only struck the Catholic Church. Instead I would like to sincerely thank those media operators who have been honest and objective and who have tried to unmask these wolves and to give voice to the victims. Even if it were only one case of abuse - which in itself represents a monstrosity - the Church asks not to be silent and to bring it objectively to light, because the biggest scandal in this matter is to cover up the truth. We all remember that only through the encounter with the prophet Nathan David does he understand the gravity of his sin. Today we need new Nathans to help the many David wake up from a hypocritical and perverse life. Please help the Holy Mother Church in her difficult task, that is to recognize the real cases distinguishing them from the false ones, the accusations from the slander, the rancor from the insinuations, the rumors from the defamation. A very difficult task, because the real culprits know how to hide scrupulously, to the point that so many wives, mothers and sisters can not discover them in the closest people: husbands, godfathers, grandparents, uncles, brothers, neighbors, teachers ... Even the victims, well chosen by their predators, often prefer silence and even, at the mercy of fear, become subject to the shame and terror of being abandoned. And to those who abuse children, I would like to say: turn and hand yourselves to human justice, and prepare yourselves for divine justice, reminding you of Christ's words: "Whoever will scandalize only one of these little ones who believe in me, it is better for him to hang his neck. a millstone and be thrown into the depths of the sea. Woe to the world for scandals! It is inevitable that there are scandals, but woe to the man who causes the scandal! "(Mt 18: 6-7). now allow me to speak also of another affliction, that is, the infidelity of those who betray their vocation, their oath, their mission, their consecration to God and to the Church; those who hide behind good intentions to stab their brothers and sow discord, division and bewilderment; people who always find justifications, even logical, even spiritual, to continue to walk undisturbed the road of perdition. And this is not new in the history of the Church. St. Augustine, speaking of good wheat and weeds, says: "Do you believe, my brothers, that we can not go up to the episcopal professorships? Do you believe that it is only in the lower and not the upper classes? He wanted the sky that we were not weed! [...] Also on the episcopal chairs there is the wheat and there is the weeds; and among the various communities of the faithful there is the wheat and there is the weeds "(Sermo 73, 4: PL 38, 472). These words of St. Augustine exhort us to remember the proverb: "the road of hell is paved with good intentions"; and help us to understand that the Tempter, the Great Accuser, is the one who divides, sows discord, insinuates enmity, persuades the children and leads them to doubt. In reality, in reality, these thirty silver coins are almost always behind these tares sowers. Here then the figure of David leads us to that of Judas Iscariot, another chosen by the Lord who sells and delivers his master to death. David the sinner and Judas Iscariot will always be present in the Church, as they represent the weakness that is part of our human being. They are icons of sins and crimes committed by elected and consecrated persons. United in the gravity of sin, however, are distinguished in conversion. David repented, relying on God's mercy, while Judas committed suicide. All of us therefore, to make the light of Christ shine, we have the duty to fight every spiritual corruption, which "is worse than the fall of a sinner, because it is a comfortable and self-sufficient blindness where at last everything seems legitimate: the deception , slander, selfishness and so many subtle forms of self-referentiality, since "even Satan masquerades as an angel of light" (2 Cor 11:14). Thus ended his days Solomon, while the great sinner David knew how to overcome his misery "(Apostolic Exhortation Gaudete et exsultate, 165). Let's move on to joys. For example, there have been numerous, for example, the successful outcome of the Synod dedicated to young people, of which the Cardinal Dean spoke. The steps taken so far in the reform of the Curia. Many wonder: when will it end? It will never end, but the steps are good. For example, the clarification and transparency work in the economy; the commendable efforts made by the Office of the Auditor General and the Financial Intelligence Authority; the good results achieved by the Institute for Religion Works; the new Law of the Vatican City State; the Decree on work at the Vatican, and many other less visible realizations. Let us remember, among the joys, the new Blessed and Saints who are the "precious stones" that adorn the face of the Church and radiate hope, faith and light into the world. It is right to mention here the nineteen martyrs of Algeria: "Nineteen lives given for Christ, for his Gospel and for the Algerian people, [...] models of common holiness, the sanctity" of the next door "» (Thomas Georgeon, sign of the fraternity ", L'Osservatore romano, 8 December 2018, page 6); the high number of faithful who receive Baptism every year renew the youth of the Church as a fruitful mother, and the numerous children who return home and embrace faith and Christian life; families and parents who seriously live the faith and transmit it daily to their children through the joy of their love (cf., Apostolic Exhortation Apostolic Church, Amoris Laetitia, 259-290); the testimony of many young people who courageously choose consecrated life and the priesthood. A great reason for joy is also the great number of consecrated and consecrated persons, bishops and priests, who daily live their vocation in fidelity, silence, holiness and self-denial. They are people who illuminate the darkness of humanity, with their testimony of faith, love and charity. People who work patiently, out of love for Christ and his Gospel, for the poor, the oppressed and the last, without trying to get on the front pages of newspapers or occupy the top positions. People who, leaving everything and offering their lives, bring the light of faith where Christ is abandoned, thirsty, hungry, imprisoned and naked (cf. Mt 25: 31-46). And I particularly think of the many parish priests who daily offer good example to the people of God, priests close to families, know the names of all and live their lives in simplicity, faith, zeal, holiness and charity. People forgotten by the mass media but without which the darkness would reign. speaking of the light, of afflictions, of David and of Judas, I wanted to highlight the value of awareness, which must be transformed into a duty of vigilance and custody by those who, in the structures of ecclesiastical and consecrated life, exercise the government service. In reality, the strength of any institution does not reside in being composed of perfect men (this is impossible) but in its will to purify itself continuously; in his ability to humbly recognize errors and correct them; in his ability to get up from falls; in seeing the light of Christmas that starts from the manger in Bethlehem, it goes through history and reaches the Parusia. It is therefore necessary to open our hearts to the true light, Jesus Christ: the light that can illuminate life and transform our darkness into light; the light of the good that overcomes evil; the light of love that overcomes hatred; the light of life that defeats death; the divine light that transforms everything and everyone into light; the light of our God: poor and rich, merciful and just, present and hidden, small and big. We remember the wonderful words of St. Macarius the Great, father of the fourth-century Egyptian desert, who, speaking of Christmas, states: "God makes himself small! The inaccessible and uncreated, in its infinite and unimaginable goodness has taken on a body and became small. In his goodness he descended from his glory. No one in heaven and on earth can understand the greatness of God and no one in heaven and on earth can understand how God makes himself poor and small for the poor and the little ones. As its greatness is incomprehensible, so is its littleness "(cf. Homilies IV, 9-10, XXXII, 7: in Spirit and Fire, Spiritual Homilies, Collection II, Qiqajon-Bose, Magnano 1995, p.88- 89; 332-333). Let us remember that Christmas is the feast of the "great God who makes himself small and in his smallness does not cease to be great. And in this dialectic, great is small: there is the tenderness of God. That word that worldliness always tries to remove from the dictionary: tenderness. The great God who becomes small, who is great and continues to grow small "(cf. Homily to St. Martha, December 14, 2017, Homily to St. Martha, April 25, 2013). Every year Christmas gives us the certainty that the light of God will continue to shine despite our human misery; the certainty that the Church will emerge from these tribulations, even more beautiful and purified and splendid. Because all the sins, the falls and the evil committed by some children of the Church can never obscure the beauty of his face; on the contrary, they give even the certain proof that his strength is not in us, but above all in Christ Jesus, Savior of the world and Light of the universe, who loves her and gave her life for her, his bride. Christmas gives proof that the serious evils committed by some will never obscure all the good that the Church does freely in the world. Christmas gives us the certainty that the true strength of the Church and of our daily work, often hidden - like that of the Curia, where there are saints - is in the Holy Spirit that guides and protects it through the centuries, transforming even the sins on the occasion of forgiveness, falls on the occasion of renewal, evil on the occasion of purification and victory. Thank you so much and Merry Christmas to all! Also this year I would like to leave you a thought. 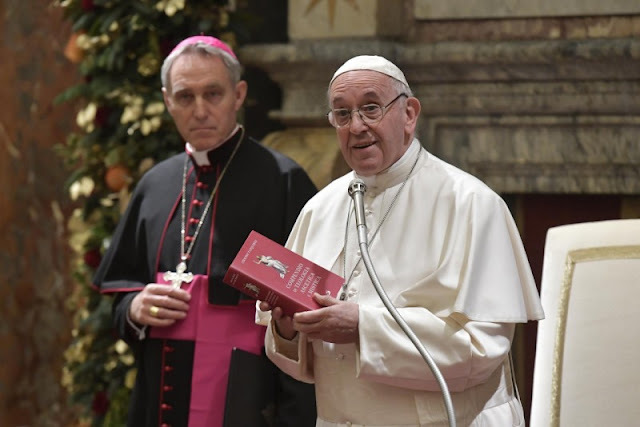 It is a classic: the Compendium of the ascetic and mystical theology of Tanquerey, but in the recent edition elaborated by Bishop Libanori, Auxiliary Bishop of Rome, and by Father Forlai, spiritual father of the Rome Seminary. I think it's good. Do not read it from beginning to end, but look for this virtue, this attitude, this thing in the index ... It will do us good, for the reform of each of us and the reform of the Church. It is for you!